Preheat oven at 275 deg F.
In a large bowl, place 1/2 package of baby kale and drizzle enough olive oil to cover the leaves. Mix with your hands to coat evenly. The trick is to coat thinly so that leaves are crispy, else they become soggy. 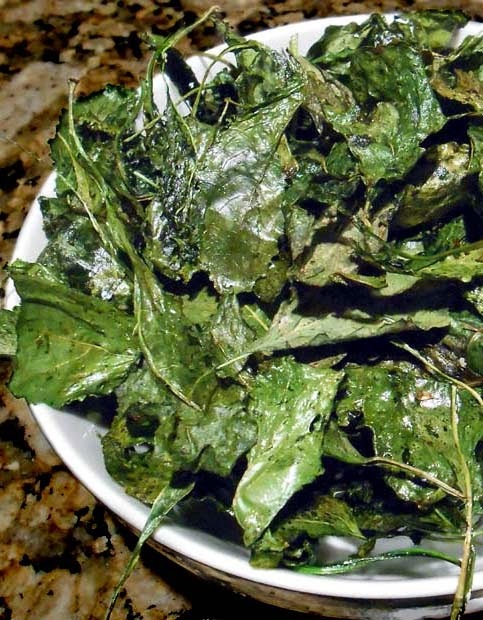 Spread the coated leaves on a baking pan. Do the same with the other half of package. Salt and pepper to taste. Bake for 10 minutes. Flip the leaves (which should be now "chippy") to get an even toast then let bake for another 10 minutes. Remove from oven then allow to cool for 5 minutes. Then enjoy!